It was only a matter of time before 360 degree video hit the band world. 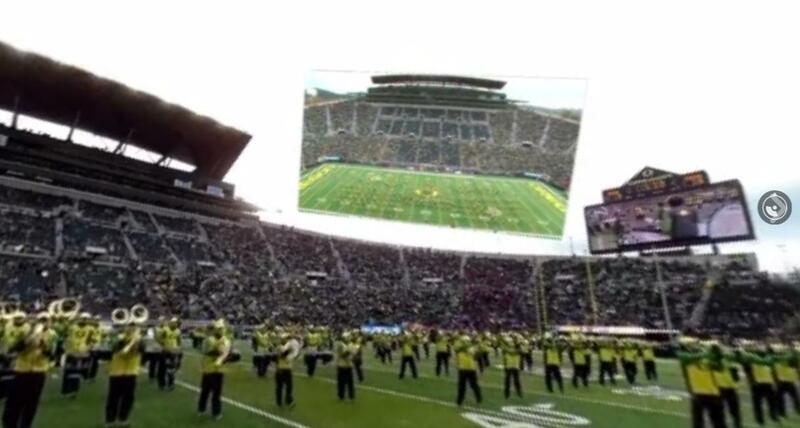 The University of Oregon set up a 360 camera pod at halftime of their band's Jimi Hendrix show this season and the result is an interactive experience unmatched in the college band world. You can literally click on the screen and turn your view in any direction. Now you can experience what it's like to march in a college band in a whole new way. We highly encourage you to try it out. Hopefully your phone or computer is compatible with the technology. You should be able to just click in the video itself and drag your way around the screen to rotate the video. You'll notice also that embedded in the video is actually a floating video screen so you can see what the show looked like from above. TOO FREAKING COOL! Share so all fans can enjoy this really cool band experience and let's hope this is just the beginning of many more 360 degree halftime shows. When you start the video you'll be in the drumline as they march out. Rotate the screen 180 degrees so that you can see the floating graphic as the band takes the field.